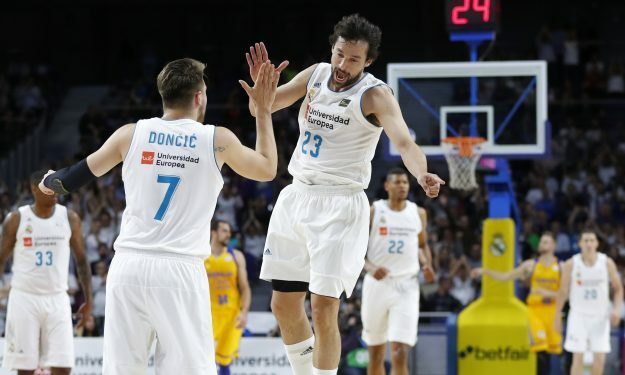 Real Madrid outstood Gran Canaria’s pressure and sealed the win in game 2. Real Madrid prevailed over Gran Canaria at home with 92-83 and grabbed its second victory in the semifinal series. Luka Doncic, who was being watched by Sacramento Kings‘ GM Vlade Divac and owner Vivek Ranadine, finished with a game-high of 14 points, seven assists and six rebounds. Sergio Llull added 13 points, while Gustavo Ayon shared 12. After a scoring feast in the first half, the hosts kept a 52-50 lead, though Gran Canaria came back strong in the third period and got in charge of the game. The tables turned in the final period, as the Madrid side restored its double-digit advantage and sealed off the victory.